As many of you know, protein is a vital nutrient for improving and increasing skeletal muscle mass, especially after exercise. And eating too little of it on a day to day basis can accelerate the normal rate of muscle loss. What you may not know however is how important the particular amino acid leucine is for repairing and building muscle. To understand how much protein you should eat on a daily basis, I like to keep it simple. Eat/drink about 20-30 grams of protein directly after your workout and per meal. If you’re lean, try to ingest 1 gram of protein per pound of body weight by the end of the evening. If you are over fat, think about what you should weigh when lean and eat for that weight. As an example, if you weigh 200 pounds but should weigh 150, try to get about 150 grams of protein per day especially if you are strength training (which you should be). 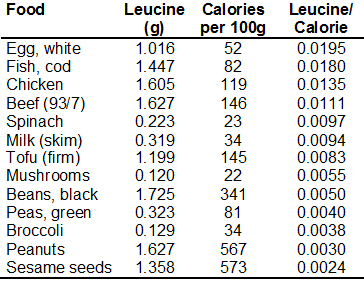 Whey protein offers a whopping amount of leucine per calorie gram! The chart below supports this. So, if you want to maximize your recovery and strength/muscle/endurance gains, consider drinking a whey shake mixed with coconut milk or water after your strength workout or endurance workouts (if you bother with endurance workouts that is). You might also want to buy some leucine powder and add this to your shake. 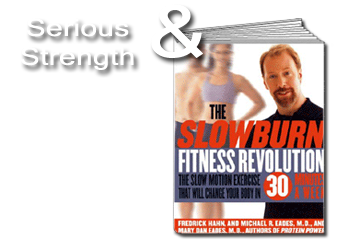 My co-authors of The SlowBurn Fitness Revolution Dr. Mike and MaryDan Eades discusses how to concoct a muscle building, fat melting cocktail shake in their book The 6 Week Cure for the Middle Aged Middle. It’s a very good book to read if you’re struggling with age-related fat gain and muscle loss. The Eades’ are super smart physicians. Enjoy! And as always, comments are welcomed. Hi, Fred! Glad to see you’re posting again. How does beef protein powder compare with whey protein powder in terms of leucine content? I have an intolerance to whey protein (based on IgG ELISA tests). I used to drink whey protein shakes all the time, and then had to give them up for more than 3 months during an elimination diet based on the ELISA results. I started drinking them again as a test, and gained several pounds after having one shake a day for three days in a row. I also like to see the higher protein recommendation. So many “experts” lately have been putting the upper limit on protein at around 56 grams, which I think is WAY too low, even if you’re not strength training. Beef protein is very good. I just got back from holiday in France and found this post from you Fred. I’d only been looking a couple of months ago and noticed that it was really ages since you last posted. I’m pleased to read this about protien as I eat around 120g protein per day and I am lean. I love protein foods but have always been concerned that I eat too much. I eat extremely low carb (around 30 – 50g per day) which means I am eating mostly fat and protein. So nice to see you posting again !